ExcelDecryptor allows you to reset MS Excel document and template (*.xlt, *.xls) passwords with guarantee. Multi-file processing with no affect on performance. Shared Workbook, Write-Protection, Workbook and Sheet passwords are recovered instantly. ExcelDecryptor allows you to reset MS Excel document and template (*.xlt, *.xls) passwords with guarantee. The unique feature of this tool is the ability to process ANY number of Excel files simultaneously without any noticeable affect on performance! 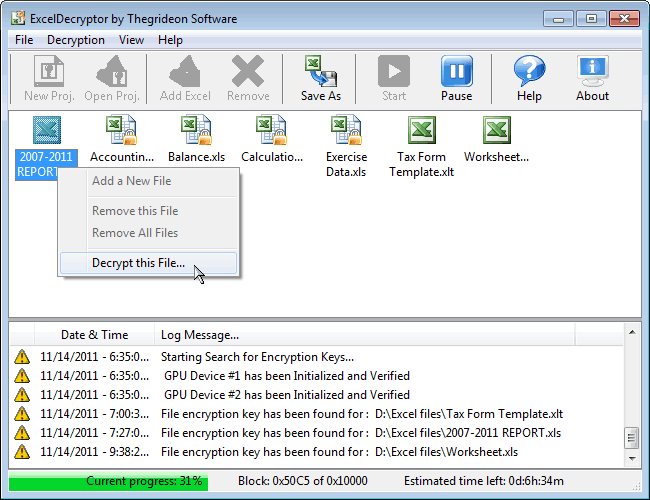 ExcelDecryptor recovers Workbook, Sheet, Shared Workbook and Write-Protection passwords instantly. ExcelDecryptor utilizes NVIDIA and AMD GPUs for processing acceleration. Change margins (top, bottom, left, right, gutter), page orientation (portrait, landscape), paper page size, page type, paper source, layout, headers and footers, alignment, etc. in many MS Word files. Word 2000 or higher required.